Modern medicine is so advanced, it's easy to assume nowadays that diagnostic and therapeutic choices are clearcut. But there are still many medical mysteries, which doctors puzzle over in sessions known as "morbidity and mortality" conferences. Here's an inside look at an "M&M" at Dartmouth-Hitchcock. By Paige Wickner and Fordham von Reyn, M.D. Today's quarantining of SARS patients recalls an earlier era, when Americans suffering from a common and often-fatal respiratory illness—tuberculosis— were isolated from society in sanatoriums. New Hampshire residents with TB were cared for at a serene mountainside retreat. By Robert W. Christie, M.D. Half a century ago, few specialists practiced in the northern reaches of New Hampshire and Vermont. The first pathologist to settle north of Hanover shares the story of his colorful career. Does prowess on the rink, the track, or the court have anything to do with proficiency in medicine? Assorted athletes with Dartmouth medical ties think there's a more than incidental connection. The news this issue includes word of several weighty matters —the appointment of a new dean (page 3) and a new chair of medicine (page 5)—as well as some flighty, though fun, stories about student antics in the tonsorial (page 12) and sporting (page 13) realms. "What do you say we play bingo?" Helping doctors ask their patients "How's your health?" What's in a (school's) name? 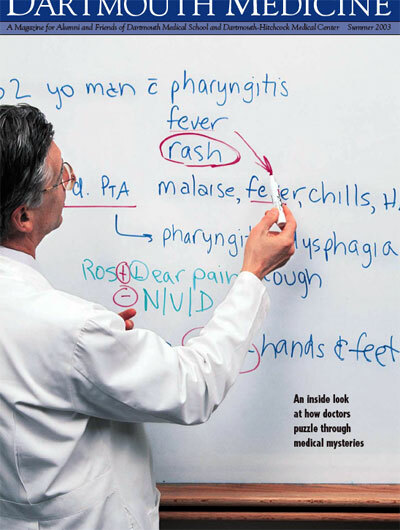 Medical students plan to publish "a literary collage"
By Mary Margaret Andrews, M.D. "A little comfort means a lot to sick kids"
As doctors work through puzzling cases in sessions called "morbidity and mortality" conferences, the whiteboard at the front of the room gets filled with notations. This photo of Jonathan Ross, director of DHMC's medicine "M&Ms," is by Jon Gilbert Fox. The associated story starts on page 32.